In a time where politics seem more divisive than ever, we’ve been lucky here in Massachusetts to have a pragmatic approach to governing, especially when it comes to energy and the environment. In 2008, we passed the Global Warming Solutions Act, which set economy-wide goals to reduce greenhouse gas emissions to 25 percent below 1990 statewide levels by 2020, and 80 percent below 1990 levels by 2050. Despite having a Republican governor and Democratic legislature, we passed an energy bill in 2016 that directs Massachusetts utilities to procure 1,600 megawatts of offshore wind and about 1,200 megawatts of hydroelectric power. With friends like that, it’s no wonder I wake up every day excited to go to work. I am currently the communications and senior policy advisor for Representative Jeffrey Sánchez in the Massachusetts House of Representatives, where he serves as chair of the House Committee on Ways and Means. The Committee on Ways and Means is charged with considering all legislation “affecting the finances of the Commonwealth.” committee writes the annual state budget and is often the final stop before a bill comes for a vote in the House. We see legislation relative to a myriad of issues, including healthcare, criminal justice reform, housing, and the environment. My role on the committee is to consider relevant research and stakeholder opinions on legislation, and to help craft a message so the public understands why and how we’re addressing these issues. I started working for Representative Sánchez two years ago as a legislative aide. Recently graduated, I was responsible for communicating with constituents, engaging stakeholders, and drafting policy memos for pending legislation in the House. Working for a Boston legislator is a unique experience, since the State House is in Boston. It’s easy to be there during the workday and then catch community meetings in the neighborhood at night, which is a bit more challenging for those in central and western Massachusetts. I have attended meetings held by the Boston Redevelopment Authority (Boston’s urban planning agency), neighborhood organizations, and other local agencies in order to keep a pulse on our constituents’ concerns. My friends often joke that I am a real-life Leslie Knope from Parks and Recreation, but I enjoy the community meetings. Those who attend these meetings have a deep institutional knowledge of the city, and have been involved in key decisions that changed the fabric of Boston. 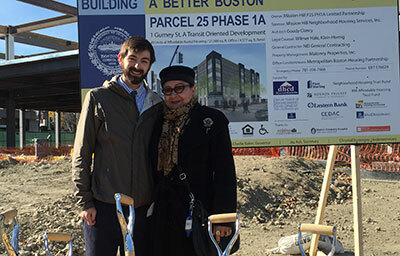 They successfully stopped Mission Hill and Jamaica Plain from being decimated by the Southwest Expressway, executed community-based planning processes, and sued the city for the right for tenants in affordable housing to have clean living conditions. I learned so much that work became an extension of my education. My current work is not so different than my memories at BC. When I was a senior, my environmental seminar group researched how the city of Newton could encourage its residents to adapt electric vehicles. Under the guidance of Professor Tara Pisani-Gareau and Newton City Councilor Emily Norton, we connected with city councilors, environmental advocates, and other community members to study their behaviors and learn what factors would encourage residents to invest in an electric vehicle. We had spent the previous 3.5 years building a foundation to understand our environment. Through classes like The Human Footprint, Earth Materials, and Environmental Economics, we had the building blocks to affect change through policy. We understood complex concepts like ice-albedo feedback. Now, we had to translate these concepts into a plan that would encourage people to change their routine. While we learned about electric vehicles through the project, the more important lesson was how to effectively engage stakeholders. The seminar project challenged us to engage beyond the lab or classroom to effectively answer the research question. After graduating, I’ve been able to put these skills to the test. Representative Sánchez tasked me with a project 15+ years in the making: redesigning Boston’s Arborway. The Massachusetts Department of Conservation and Recreation (DCR) had convened public meetings a year prior to present new designs for the Arborway, an urban parkway along the Emerald Necklace Park in Jamaica Plain. The meetings were well-attended, and DCR promised the community they would follow-up to address outstanding concerns – both positive and negative. It had been one year with no word, so we wanted to contact DCR and ask for an update. I employed the help of neighborhood groups, advocacy organizations, and community leaders to amplify the voice of the community and formally request DCR for a status update on the projects (one community leader is well-known to the BCEEAN community – Professor Noah Snyder just happened to live nearby). After many long nights and community meetings, we finally were able to get a response, have DCR re-focus on the project, and commit to a series of short-term fixes. I think the main takeaway from this story is that Boston College teaches us the fundamental concepts, and it is up to us to translate that learning into actionable change in the real world. There are many ways to find ourselves as stewards of the environment. For some, it is to continue research in a lab. For others, it is working at a business that manufactures sustainable energy products. For me, it is to engage individuals to understand how we can create a consensus and create a framework to encourage sustainable behavior. I understood that redesigning the parkway was important because the design would encourage active transportation – people biking and walking meant fewer cars and emissions. It was important to the community. So, motivated by the end product, I was able to execute on a plan using the skills I learned at BC. I may not work directly on environmental issues every day of my job. But, I am a product of the Boston College earth sciences department, and that mindset permeates into everything that I do. This past January, Massachusetts passed a law to encourage consumers to buy electric vehicles. I’d like to think it was because of our environmental seminar project or my work in the legislature. In reality, it is the result of a network of people from different backgrounds across the state coming together to address an issue. This approach has enabled us to accomplish so much in this Commonwealth, and will be crucial as we build upon our investments in clean energy and make progress towards greenhouse gas reduction goals. 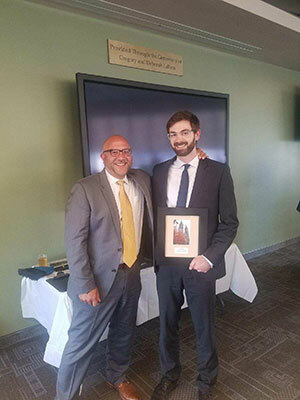 Collin Fedor '15 is currently the communications and senior policy advisor to Representative Jeffrey Sánchez, Chairman of the Massachusetts House of Representatives Committee on Ways & Means. He graduated with a major in political science and a minor in environmental studies. A current Cambridge, MA resident, he spends his free time exploring the city on bike and hiking the White Mountains on weekends.